Either I missed the obvious solution, or there is indeed no simple way to catch double click events on a given row of Microsoft’s WPF DataGrid. /// Handles double-clicks on datagrid rows. /// Finds a parent of a given item on the visual tree. /// this method falls back to the logical tree of the element! 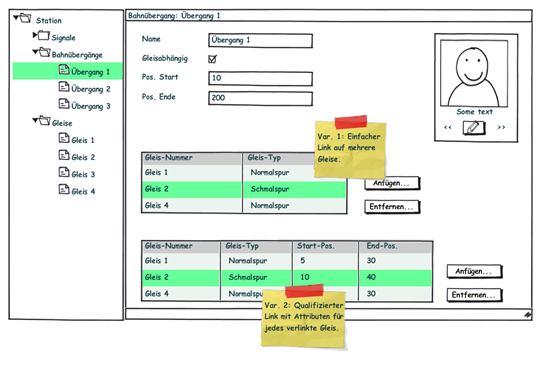 A TextBox is bound to a numeric Age property of your model. As soon as the user enters a value in the Textbox, the property on the model is updated. The model then validates whether the entered value is valid (range from 1 to 130 years). Karl Shifflet recently updated his article on this very subject, where he outlines an MVVM-based approach to the problem (highly recommended reading material!). In my case, however, I was looking for a simpler solution. I had validation and views already in place and just wanted a visual representation of invalid input that cannot be bound to the model. A binding with ValidatesOnDataErrors=True ensures that the model validation logic is being invoked. 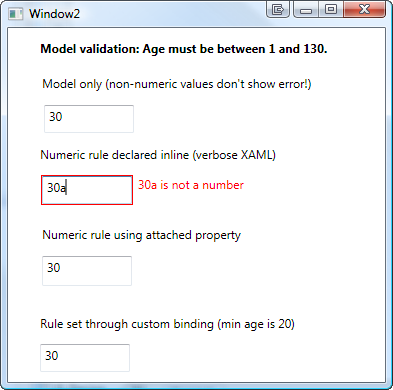 Additional WPF Validation Rules take care of invalid input that can not be bound to the model. That’s it already! An invalid numeric value (below minimum, above maximum) is handled by the model, everything else is caught be the NumericRule (see attached sample for the sources). In the sample above, I declared an attached property of type ValidationRule that points to by custom rule. However, depending on your case, you can make your attached property as simple/complex as you need. A great article on this subject was published by WPF master Josh Smith on CodeProject, where he outlines this exact pattern. /// that can be used to narrow the allowed range. /// Creates a new instance of the binding with default values. /// This method is being invoked during initialization. The attached sample shows you all the techniques I described above. /// Provides enumeration over type <see cref="X"/>. Note the type constraint: The second type parameter (X) must be convertible to the first one (T), which ensures that you can’t break the collection. Of course, rather than just IEnumerable<IAnimal>, you could easily expose IList<IAnimal> that way, but you would risk runtime exceptions if somebody tried to inject another IAnimal implementation into the base class that is not an instance of type Pig. However, in a safe environment, this might be well feasible if it lets you expose your collections as lists and still stick to interfaces. I included a newsletter module into the blog – in case you would like to stay up-to-date about what’s going on here, you can now subscribe to a specific newsletter. I’ll provide newsletter categories for all projects that are being released here, starting with the WPF TreeView, so this will be a convenient way to get notified if a new version has been made available.